“It’s gorgeous,” said an ecstatic Angie Everhart about her new engagement ring from boyfriend Carl Ferro. 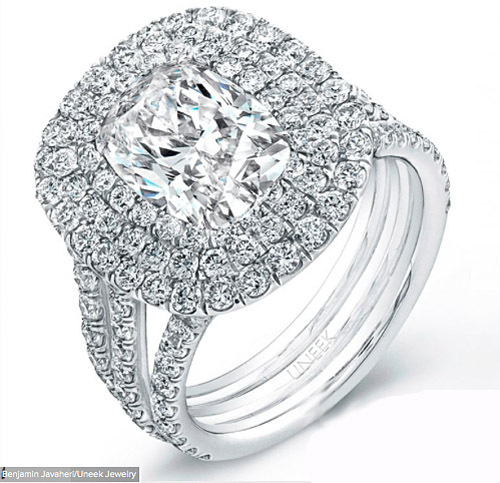 “I don’t know any girl who wouldn't like this ring.” The platinum stunner features a cushion-cut center stone, framed by not one, but three, shimmering halos — 146 diamonds for a total weight of 4.5 carats. "It blinds you when you see it," Ferro boasted to ABC News. "It's really pretty." The ring was designed by Los Angeles-based Benjamin Javaheri. The redheaded actress couldn't contain her excitement and tweeted the news of Ferro’s marriage proposal at 3:34 a.m. on Wednesday of last week: "My man @CarlFerro1 proposed to me in the exact spot where we had our first kiss!" wrote Everhart. "I'm beyond happy!" What Everhart didn’t mention in her tweet was that the “exact spot” of their first smooch was in the elevator of Redbury Hotel in Hollywood, where the couple enjoyed dinner at the trendy Cleo restaurant. The couple had revisited the eatery to celebrate their second anniversary as a couple. When they entered the elevator, Ferro pulled out the engagement ring and surprised Everhart with a marriage proposal, according to TMZ. Life is looking much brighter for the 44-year-old former model, who underwent surgery for thyroid cancer exactly a year ago. This is the fifth engagement for Everhart. It will be her second marriage. Everhart’s former fiancés have included the likes of actors Sylvester Stallone and Joe Pesci, businessman Jimmy Taboulis and singer Ashley Hamilton. Her marriage to Hamilton lasted only four months. Everhart and Ferro each have one child from a previous relationship.